Thus far we have completed three Hog Days of Summer events. And with the craziness relatively contained I figure it’d be a good time to write some reflections. First off, it’s an otherworldly feeling to see “your” event. I’ve been part of many other people’s events as my own table. Whether it be the Hot Sauce Expo or aPORKalypse 2013, I was part of the show and not the producer. So to see a massive banner produced by the award winning Founder’s Brewery bearing the words “Arrogant Swine Presents” – otherworldly. One of the things that surprised me was that I actually have repeat guests. My picture was that people would come to the events and make it one of many different fun things they’d would be doing this summer. It’s extremely flattering that not only people like the event; they actually keep coming back for more! It’s still an oddity when someone comes up to me afterwards and thanks ME for putting the events together. People are spending their hard earned dollars and their free time to join me for a Saturday afternoon or evening. If anything I’m the one who should be thanking THEM!! And indeed I am extremely thankful that people are willing to share in my craziness. 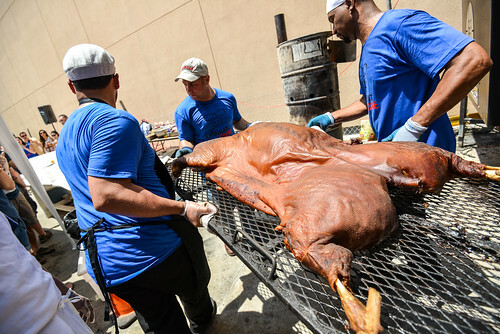 Cooking hogs once in a while and doing it for several events and caterings in a row is night and day. I’ve been able to pick up lots of new tricks this summer - Everything from how to transport the animal to modifying the preparation for line service. 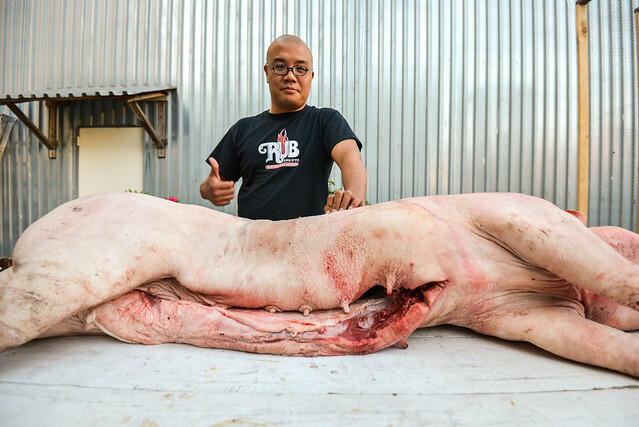 Our hogs seem to be a hit all summer with people coming back on line for 3 or more servings! It’s also a confirmation that people of New York do indeed appreciate traditional North Carolina BBQ the way it was intended to be served. Many “Carolina-style” places seem ashamed of the traditions and seek to doctor them up with sugar and thickeners. Founder’s selection of craft beer continues to be a hit all summer and we are most definitely blessed that a brewer of their caliber agreed to partner up with us for these events. Their All Day IPA is unquestionably THE BEER of the summer. Full of flavor yet perfect for a hot summer’s afternoon.